This is it, the night of nights for the 2017/18 season. Come along and congratulate all award winners and celebrate a great season of cricket. Please express your interest on the club Facebook page to confirm catering numbers and table settings: RSVP before Tuesday 2nd April. SCC is pleased to announce that Brad Hunter has been appointed senior Captain/Coach for the remainder of the 2017/18 season. Brad first came to the club in 2012 as an experienced player and had previously held the coaching position at Maribynong Park with success. Brad brings with him enthusiasm for the role, is an excellent on field performer having featured in the GDCA Team of the Year and provides outstanding leadership for our young players. Dylan Wright decided to stand down as Captain/Coach and will also cease as a player. We wish Dylan all the very best for his future endeavours and thank him for his efforts. The SCC Committee have been working through challenging times recently with the vacating of senior positions however are assured of stability for the remainder of this season and beyond with recent appointments of Brendan Doyle as President, Bec Botten as Treasurer and now Brad Hunter as senior Captain / Coach. on behalf of SCC Committee. The clubs Social Committee is organising a special evening including guest speakers from within the club and also a celebrity guest speaker. 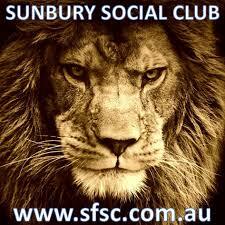 SCC Juniors Christmas Party Featuring: Jumping Castle and BBQ Starts at 5:30pm at Clarke Oval near the club rooms. Wishing all friends and family of Sunbury Cricket Club a merry Christmas and we will see you all safe and well in the New Year.